In the United Kingdom, one of the most common reasons to present to the GP surgery is a skin problem – each year a quarter of the population will present to their GP for this. This is true for patients of all ages – 1 in 5 babies have eczema. Skin disease is the second most common health complaint in adults. Aging skin presents as drying, thinning, wrinkling and sagging, giving rise to a whole industry of anti-aging skin creams, as we know! Chronic and genetically programmed skin conditions such as rosacea present in adulthood and become more troublesome as skin ages and hormones get unbalanced. But treatment of these is still regrettably considered cosmetic. Skin diseases are often underestimated because they are not usually life-threatening. But they cause significant discomfort, disfigurement, psychological trauma and impair social functioning. Why is skin disease so common? The skin is an extraordinary structure. We depend on this 1.7 m2 of barrier to protect our internal contents from the external environment. Most of the external world is harmful, even fatal if our innards are exposed to it. 3) each cell types it contains can ‘go wrong’. 4) skin is readily visible, responds rapidly to change – hence we see a large number of skin diseases. 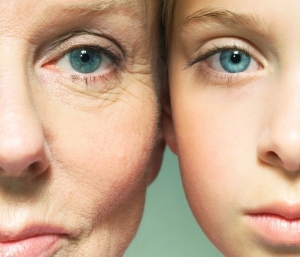 What happens to skin with Aging? Our skin is exposed to the elements as we age: external forces like the sun, harsh weather and bad habits. But some causes are preventable, and we can work on these to help our skin stay supple and youthful. How our skin ages depends on several factors including our lifestyle, diet, heredity, and other personal habits. Smoking for example creates free radicals. Free radicals are formerly healthy oxygen molecules that have become overactive and unstable. Free radicals damage cells and as one of the effects of cell damage is premature wrinkling. loss of subcutaneous support (fatty tissue between your skin and muscle). reduction of hormones such as estrogen, progesterone and testosterone. 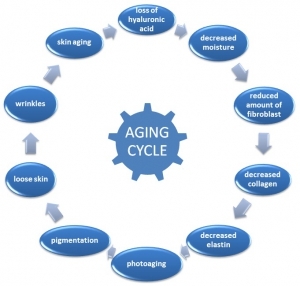 Many factors contribute to age-related changes in skin. Think about all the activities we do everyday all through our lives, such as facial movement and expressions and also the forces that we continually work against – like gravity and physical or mental stress. Skin develops lesions such as lumps / tumors. Skin becomes slack. The loss of the elastic tissue (elastin) in the skin with age causes skin to hang loosely. Skin becomes more translucent. This is caused by thinning of the epidermis (surface layer of the skin). After age 50, we often start losing bone thickness in the lower face. This makes skin look puckered, especially around the mouth and chin. Cheeks sag below the jawline, causing jowling. Sunlight, UV-A and B rays even on cloudy days are the main cause of aging skin. With recurrent or long term exposure, UV light such as sunlight damages elastin, causing it to breakdown. This makes skin stretchy and saggy as it cannot snap back after stretching. Skin that lacks collagen and elastin will bruise and tear easily but take ages to heal. Most of these changes cannot be noticed until they have progressed beyond the skin’s ability to repair itself. So if you are young the injury from sunbeds and sunburn happens silently in the background. The damage will become obvious in later life. Nothing can totally reverse the damage from sun/ uv rays. But skin does repair itself to an extent when it is healthy. It is always a good time to start protecting yourself from sun exposure and skin cancer. You can delay premature aging skin from sun damage, by remembering to to stay out of the sun , covering up, wearing a hat, and making a habit of using sunscreen spf30+ daily. As skin becomes less elastic and supple, expression lines no longer fade when expression muscles relax (usually after about 35 years of age). Some of us who have familial heavy or saggy brows, or lax upper eyelids, will constantly use the forehead muscle (frontalis) to open our eyes wide. This action is often involuntary and we don’t know that we are doing it. Frowning to concentrate or focus the eyes is similar. These make horizontal creases appear on the forehead, “11” lines between the eyebrows at the root of the nose (glabella). Sleep creases are due to habitual pressure, and can persist in aging inelastic skin. The hairline, temples, cheeks are prone to this. Lying on your back when sleeping may help a bit. Dry skin and itching is common in later life. Elderly people suffer more from dryness in winter (“winter itch”) as heated indoor air is dries the skin. Aging skin loses its oil glands and stops hydrating itself. Strong soaps, hot baths and some prescribed medications make dry skin even worse. Acne occurs both in young people and in adults, and is a frustrating skin problem. Excessive sweating can interfere with everyday activities. Sweat from the underarms often soaks through clothes, causing obvious sweat marks. Wrinkles are an inevitable part of the natural aging process. 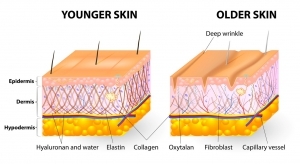 As we become older our skin gets thinner, drier and less elastic. Eventually, wrinkles, creases and lines form on our skin. Simply put, cellulite is fat pushing against the connective tissues of the skin. This creates the lumpy, dimpled look. Does your face in the mirror look older than you are? If you answered “yes”, like so many have, it is possible you have noticed sagging skin or areas of discolouration (“age spots”).